(APN) ATLANTA — For at least the last nine years, the City of Atlanta has continued to arrest people for violating seven laws contained in Chapter 106 (“Offenses and Miscellaneous Provisions”) that have the actual or potential effect of criminalizing homelessness, Atlanta Progressive News has learned. For some of the ordinances it is not immediately clear how many of the arrests were of homeless persons; while with other ordinances, like urban camping and panhandling, it is clear that many, if not all, were of people currently experiencing homelessness. “You just can’t be human no more and just be in peace without breaking the law,” Larry McNeil, a homeless man living in Atlanta, told APN. 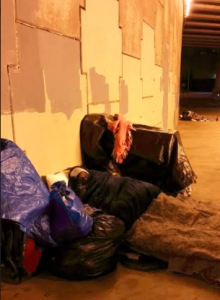 Atlanta’s ban on Urban Camping (106-12), which criminalizes sleeping or storing one’s belongings in public areas, appears to be the most targeted towards homeless people, as being homeless and unsheltered does imply the need to sleep in public. The City of Atlanta has conducted 320 arrests for Urban Camping since 2009, according to statistics APN has obtained from the Atlanta Police Department. Marshall Rancifer, an advocate who works with homeless people, said he was surprised the number was so low, as many homeless people have told him they have been arrested for urban camping. When traveling around Atlanta, especially under inter-passes, one is likely to see some of the many people who are sleeping outdoors, with or without tents. The City of Atlanta continues to lack adequate shelter beds to meet the unique needs of each person currently experiencing homelessness in Atlanta. Some stay away from the crowded, chaotic shelters, because they say it aggravates their mental health. Others complain of stolen belongings; inability to bring spouses, children, or pets; shelters that kick people out in the morning with nothing to do. Mayor Keisha Lance Bottoms has made ending homelessness a priority for her new administration, and many agencies are working together to move forward on spending the Homeless Opportunity Bond dollars that were approved by Council in 2017. Yet, it will take at least two to three years to fully implement the new beds and services, and even that will not be enough. Money is necessary; but no amount of money on shelter beds will solve homelessness, especially as new people are pushed into homelessness every month due to the ever-increasing housing costs in Atlanta, and with Atlanta’s remaining affordable housing stock gasping for air all around us. Therefore, for those persons left unsheltered, Atlanta’s law on Urban Camping basically criminalizes sleep: The City of Atlanta appears to have arrested 320 homeless people for sleeping. Atlanta’s laws prohibiting panhandling, currently enacted as “Monetary Solicitation” (106-85), have had a long and storied history, which APN has chronicled for some thirteen years. Atlanta has changed its panhandling law several times over the last thirteen years, beginning with a 2005 change that put Atlanta in the national headlines. That 2005 law (at the time, Chapter 43 “Commercial Solicitation”), among other things, purported to ban panhandling in the so-called “Tourist Triangle” and the “King Center Tourist Area” altogether. (05-O-1008). The City claimed, at the time, that in the “Tourist Triangle” and “King Center Tourist Area,” entire geographic zones consisting of multiple square blocks, people’s U.S. Constitution First Amendment rights to ask others for charity would not apply. Another feature of the 2005 panhandling law provided for Outreach Team Evaluators and Community Outreach Services–teams that would provide referral and outreach services to homeless people who were issued citations for panhandling. In 2012, as if to make a clean break, Chapter 43 (“Commercial Solicitation”) was stricken entirely; and the current section, a section within Chapter 106, 106-85 (“Monetary Solicitation”), was enacted. (12-O-1324). At the time, it was revealed that the APD had never enforced the outreach team component of the Commercial Solicitation Ordinance; and it was not included in the new law. The City’s 2012 law removed the geographic areas like the Tourist Triangle, and focused on narrow “time, place, and manner” restrictions, like panhandling near egresses and ATMs. City Attorney Cathy Hampton said at the time that this was to make the ordinance constitutional – at a press conference APN observed at the time. Yet, in 2015, with two ordinances, the City re-added the Tourist Triangle and the King Center Tourist Area back in, and added two new areas where First Amendment rights were deemed invalid–called the Auburn Avenue Corridor and the Midtown Theatre District. (15-O-1189, 15-O-1267). While the City Council and Mayor Reed, by legislation, put those geographic no-speech zones back in, they apparently forgot or decided not to restore the outreach services component. Not a single councilmember opposed the 2015 legislation. Apparently not wanting to be left out, Councilwoman Cleta Winslow (District 4) also sought in 2015 to add no panhandling zones to the Historic West End and Adair Park, but the Law Department asked for the ordinance, 15-O-1307, to be held. According to statistics provided by the APD, there have been 484 arrests between 2009 and 2017 for 106-85 (Monetary Solicitation), including 119 arrests in 2009, 126 in 2010, 102 in 2011, forty in 2012, nine in 2013, seven in 2014, 23 in 2015, seventeen in 2016, and eleven in 2017. However, these statistics appear to be incorrect for at least the years 2009, 2010, and 2011, seeing as how 106-85 was a “reserved” section prior to 2012. On February 09, 2018, APN sent an email requesting clarity on the data prior to 2012, and whether it perhaps relates to the former Chapter 43 arrests; we have not received a response as of Feb. 10. In any event, the data shows a substantial decline in panhandling arrests beginning in 2012. One of the known panhandling arrestees is Mr. Sean Ramsey, who spent 72 in days for holding a sign that said, “Homeless Please Help,” before receiving assistance from the Southern Center for Human Rights, according to the Fulton County Daily Report newspaper. In 2012, Councilwoman Felicia Moore (District 9) introduced an ordinance, which passed unanimously, asking the Municipal Court to provide quarterly reports to the City Council’s Public Safety/Legal Administration Cmte, on the City’s enforcement of its panhandling ordinance. (12-R-1423). Moore, who now serves as City Council President, recently told APN she does not know of any such reports being given pursuant to the 2012 resolution. Atlanta’s law against moving household goods at night (106-88) appears to potentially burden homeless people, who may choose to take some small portion of their household goods with them upon eviction. The law also poses challenges for working people in Atlanta who need to relocate from one apartment or home to another, but who are unavailable to move household goods during daytime business hours. Twelve people have been arrested for moving household goods at night between 2009 and 2013, although APD has not enforced the ordinance since 2013. The City of Atlanta has made 6,428 arrests for defecating or urinating in public (106-130) between 2009 and 2017. It is unclear how many of these arrests were of homeless people, as opposed to perhaps drunk, housed people. However, the lack of public restrooms in Atlanta does raise the question of where homeless people are expected to engage in activities like urinating, which are intrinsic to being a human being. Atlanta’s curfew ordinance, 106-27, appears to have authorized some 801 arrests of youth and teenagers in Atlanta between 2009 and 2017. It is not immediately clear how many of the youth arrested were homeless; however, when youth run away from home in Atlanta and cannot find shelter, they are, by definition, violating the City’s curfew when the clock reaches 11 p.m. on a weeknight (midnight on a weekend). The law gives exceptions to youth who are traveling with the consent of their parents, traveling to or from a First Amendment activity, or traveling to or from a school activity, but does not provide an exception for unsheltered, homeless youth. A second curfew ordinance, 106-229, dealing with school hours, requires police to detain youth during school hours and bring them to school. There have been three arrests for this ordinance in recent years, although it is not clear why there would be any arrests, seeing as how the ordinance requires youth to be brought to school, not jail. Finally, a provision, 106-405 (“Prohibited Acts”), relating to “Atlanta’s Drug-Free Commercial Zones,” purports to criminalize activity that–according to a 2007 resolution–is not criminal: that is, merely being present in a so-called known drug area. There have been 1,619 arrests for section 106-405 between 2012 and 2017, though there were none between 2009 and 2011. There was a great uptick in 2015 and 2016, in which there were 527 and 868 arrests, respectively, followed by 187 in 2017. There was only one such arrest in 2012 and 36 in 2014. Overall, enforcement appears to have recently spiked. The provision is nearly identical to the former Disorderly Conduct 6, or former “DC 6,” which the City struck in 2007. According to Anita Beaty, the former Executive Director of the Metro Atlanta Task Force for the Homeless, DC-6, before it was stricken, was used by Atlanta Police as a “catch all” ordinance to arrest homeless people, especially Black men, who were doing nothing wrong. “It shall be unlawful for any person within the designated drug-free commercial zones of the City of Atlanta to engage in or be in or about any place where… the illegal sale or possession of alcohol beverages or narcotics or dangerous drugs is practiced, allowed or tolerated,” the ordinance begins. The Council struck DC-6 from the code in 2007, but did not address the similarly worded section in 106-405. However, it is not clear how many of the 1,619 arrests had some element of intent or purpose, or how many of them were simply for being in a known drug area – which the Georgia appellate courts have ruled is not an actual crime. It is the duty of the police to ignore repressive laws when they can, for the city council not to pass embarrassing laws and the public especially the public to light a fire under the feet of decision makers wherever they may hold meetings or take testimony. Some towns have “warming stations” in Fire Departments and open to the needy. see National Alliance to End Homelessness Wash D.C.